We have had a very long winter – unusually cold temperatures. 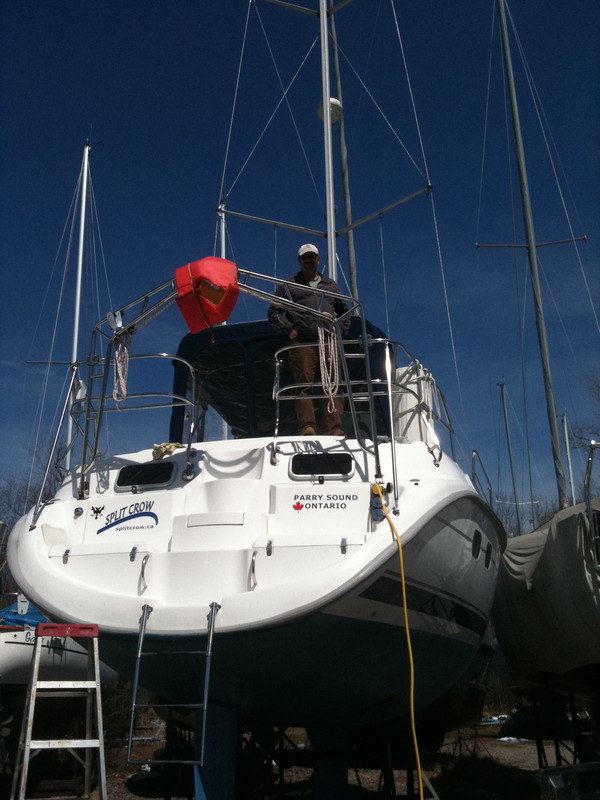 Finally, on April 8th, Dennis went out to the marina and uncovered the Split Crow. He spend all day taking the tarps off, putting up the canvas and generally getting things ready. Of course, it was a beautiful day, so he didn’t mind at all. He spend a good part of yesterday (April 9th) getting the boat back in order too. He put the interior back together and completed a bunch of tasks that needed doing inside. 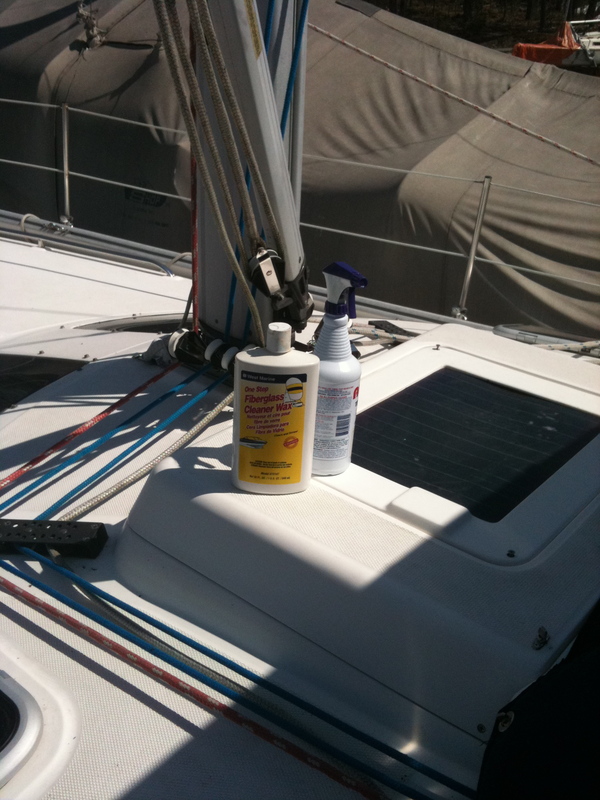 Dennis also spent a lot of time cleaning deck of the boat. He polished and cleaned and made it look great! He took the sliding hatch apart (this has the solar panel on it) and cleaned up ten years of disgusting dirt. I arrived just in time – he was all done! All I did was take a few pictures and then give him instructions as to what I wanted done before we go away for the summer. This year, we really don’t have many major projects but I do want a switch installed near the shower that runs the sump pump. We have a very high quality pump (it’s the third replacement so we bought a good one) but it is very noisy and the switch to turn it on and off is way over near the nav station, so I have to turn the switch on, then run over to the shower and as soon as I’ve done the shower, the noise of the pump just about drives me off the deep end, so before I even towel myself off, I have to run back to the switch while I’m dripping wet and turn it off. So, Dennis is going to put another switch right outside the shower. Another thing I would like is a good place to store the fresh fruit and vegetables. Last year, I kept them in a bin under the bed in the forward cabin and I may have to do that again, but I would prefer an alternate storage container. If there are any other Hunter 420 Passage owners out there who have figured this out, please let me know. I am open to suggestions! There are a few other little things that need to be done, but basically, we are waiting for the ice to melt from the bay so that we can launch the boat! Hopefully before the May long weekend but we’ll see – spring is a couple of weeks behind this year. We have beautiful weather – perfect for sailing. Nice and warm, with a good breeze blowing in some direction. We don’t actually know the speed of the wind or its direction because we are still without our Nexus wireless wind instrument. 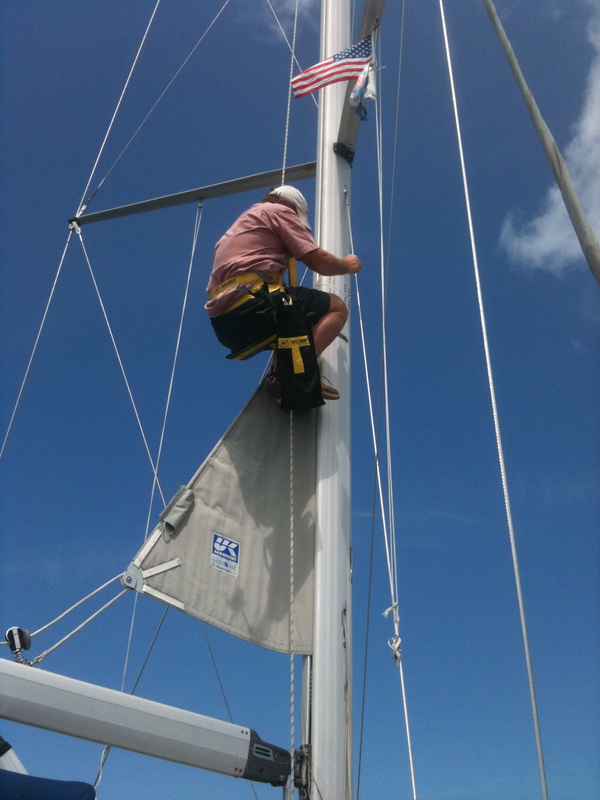 It only worked for one week – after that, it gave out completely and Dennis spent quite a few trips going up and down the mast (in some very expensive but safe contraption). But I digress from the point of this story. I will keep a separate log of the goings on of the Nexus. Since I am not a very experienced sailor, I’ve been practicing my driving skills when we leave the dock. Last week was a spectacular exit – no problems whatsoever and I was quite confident until a shrieking sound started up. It was the engine overheating and we weren’t even five minutes away from the marina. It turned out to be an air pocket (or something) and Dennis had us underway again within minutes. 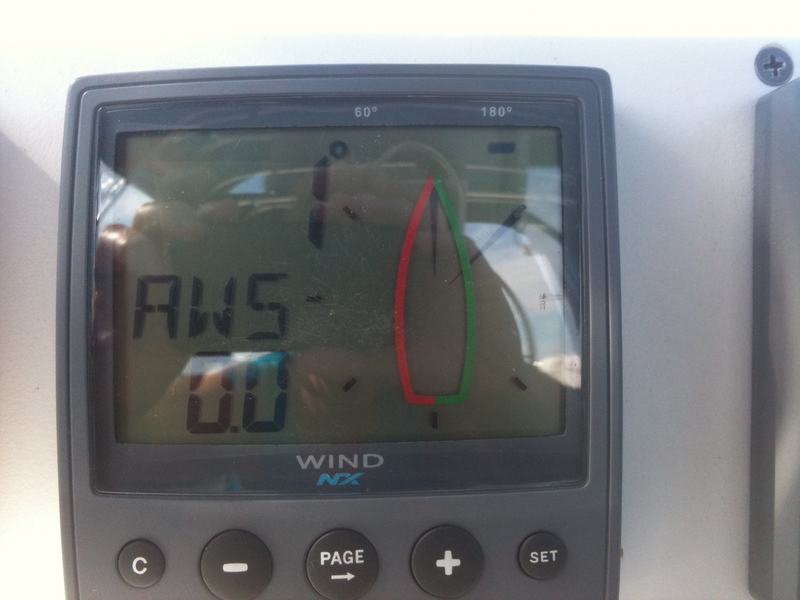 Today’s exit from the dock was pretty good although it was a bit trickier because of the wind. However, within 30 seconds, we had bumped into something under water. It was apparently a cement block and Dennis mentioned that he should have reminded me about that. I cannot be held responsible for that though. You don’t expect to have cement blocks lying around in the middle of the channel. No damage though, so we carried on to Regatta Bay on Franklin Island. We had an easy ride there and ventured through Canoe Channel. It was pretty shallow though (8 feet) and I doubt we’ll be able to take that short cut in the summer unless it rains for the next three weeks. We anchored in the middle of Regatta Bay and were the only boat there for most of the day. The first thing we did was go swimming in our new “shorty” wet suits. They are terrific! The water temperature was 20 degrees Celsius and that is quite warm for the end of May in Georgian Bay but not for swimming around for half an hour. Unfortunately, we looked like a couple of beached whales with these suits on. We seem to have developed bellies in the past couple of years and they definitely show in the wetsuits – no disguising any imperfections! Anyway, the wetsuits kept us warm and more buoyant, so we were able to swim around the anchorage for a good long time. I went snorkeling and saw lots of zebra mussels, a few crayfish, and not much else. Hardly any garbage either, which was very encouraging. 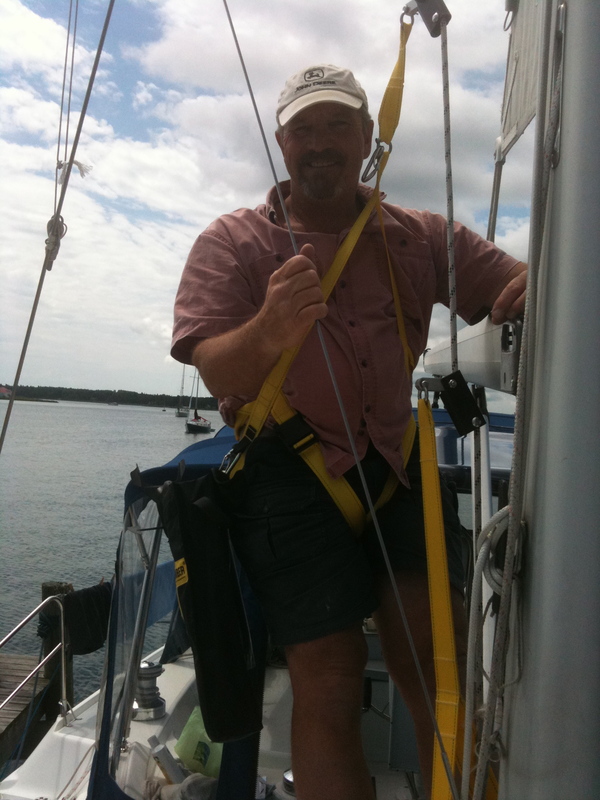 Dennis dove around the boat and checked the new anchor chain – he’s quite proud of it. I guess it is much safer to have all chain instead of line, and in this wind (not that we know the speed of it), we are hardly swinging around at all. The day was going very well but we did discover that the shower pump would not pump the water out and over the side of the boat. We had already replaced the pump last year in Mackinaw City and thought that our troubles were over. We spent considerable time troubleshooting and knew that the pump still worked but it had lost a lot of power and couldn’t manage to push the water up and over the side. So Dennis now has another job – to install a new pump. This time though, he is going to install a really good one. We’ve already had two pumps and although they were expensive, they need to last longer than eight weeks of boating. The only drawback of the good pump – we’ll call it The Terminator – is that we have to turn a switch on at the control panel when we have a shower and turn it back off when our shower is over. I think we can handle that inconvenience! That is all that has happened so far today. Dennis is out fishing and I am having my tea. I’m sure more adventures will await us before the weekend is over! 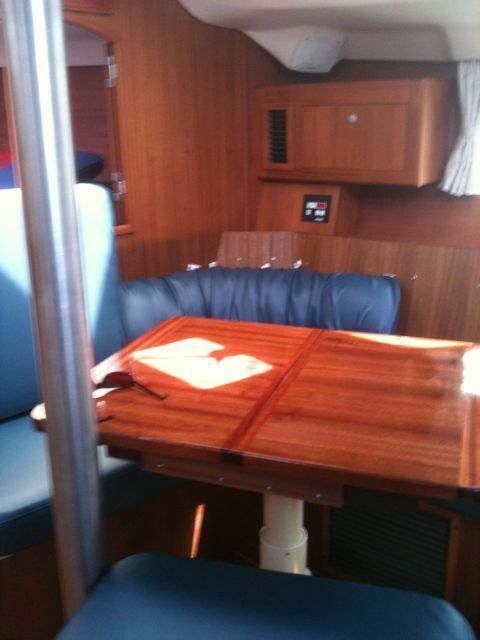 Well, as you can see, the boat is getting some interior work done. Dennis has being building the table and it looks great! The interior cushions are half done and they really make a difference in the salon. Progress is being made! 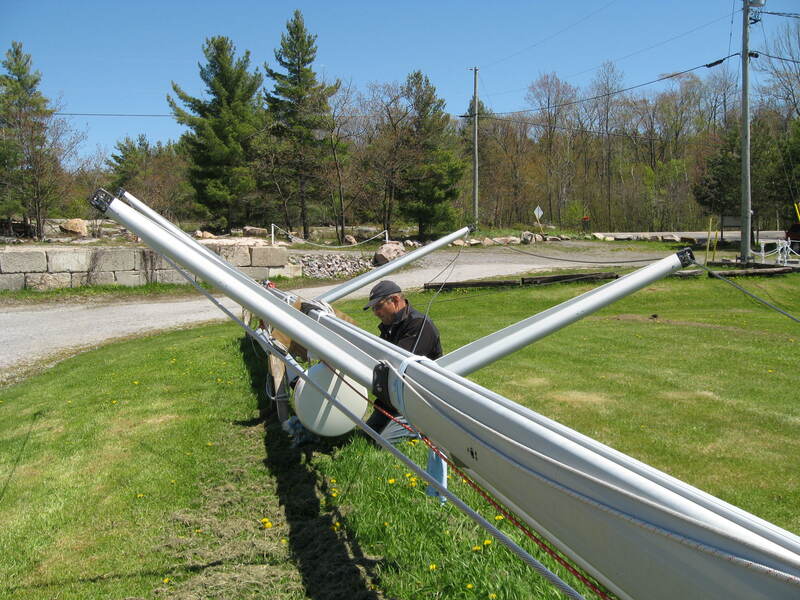 The Split Crow was successfully launched on May 6th, 2009 at Killbear Marina. It was a bit of a concern however, since we weren’t actually sure if she would float – for all we knew, she could have ended up at the bottom of Georgian Bay! But, with the expert help of Ed and Will (owners of the marina), the boat made it safely into the Bay. Bonus – the engine started too! Here are some pictures of us getting the boat. We drove to Long Island on Thanksgiving Weekend 2008 to see it and then Dennis made arrangements for the boat to be trucked back to Parry Sound.